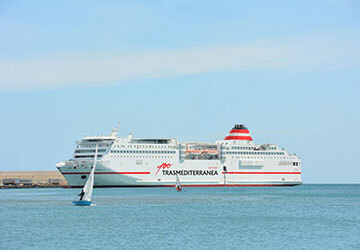 The Sorolla has been in the Trasmediterranea fleet since around 2001 and can carry up to 1000 passengers and 330 vehicles. 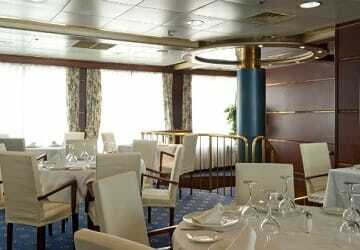 Sorolla has the most sophisticated and comfortable facilities making your journey an enjoyable experience. Onboard you’ll find a la carte and self-service restaurants, café, pub, swimming pool, jacuzzi, solarium, gym and sauna, a reading lounge, a games lounge, baby changing area, nursery, heliport, cinema, pet kennels, medical facility and a shop. For younger passengers there is children's play area containing soft toys, tables with chairs, and a TV. Children can also enjoy the shallow area of the swimming pool and can play board games in the games lounge. The Sorolla has specially adapted cabins and toilets for passengers with reduced mobility, as well as ramps to facilitate mobility onboard. If assistance will be required onboard then it is advised to inform us prior to booking to make sure that your needs can be accommodated. Guide dogs travel free of charge. Please Note: Whilst we have taken great care in making our Sorolla guide as accurate as possible, onboard facilities, services and entertainment may vary depending on the date and time of year that you travel, facilities mentioned may change without notification and ferry companies reserve the right to operate vessels other than those mentioned at time of booking without prior notification. The cruise was awesome, I would strongly recommend this ferry. Unfortunately, the cabins were not really clean. On the way we had chip remains in the beds and on the floor. The toilet was, unfortunately, not really clean. On the return trip we had to the extent legally clean beds, but several foreign hairs were on the shower floor and also the toilet was not cleaned completely. Super are embarking or disembarking from the ferry. "Everything to the full satisfaction "
No complications, all according to plan. All right. 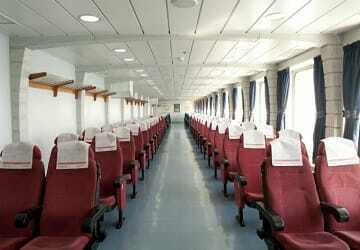 I would have appreciated a lounge similar to the Neptuno in Balearia, where the seats were big and comfy. I was ready to pay more to be in a more comfortable seat. 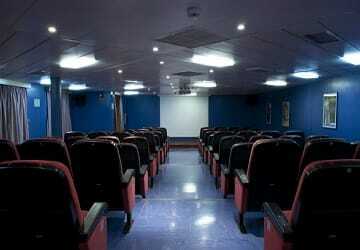 It is not a secret that the seats are old, uncomfortable and look more like an old cinema. The rest is well-organised. For what I paid, you can't really ask for more. Overall pleasant crossing (6 hours). Although the ship was not punctually, but with about 45 minutes late, but it arrived on time. The ladies toilet near the bottom salons morning was very dirty, but was soon cleaned. On the sun deck more chairs / sun loungers may be present. 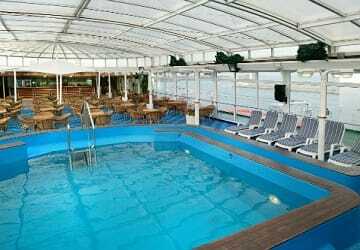 Even though the ship is not the best one I have been in because there was not a lot of space on the deck for the length of the journey, I have to say it was impecable and the attention to detail of the the staff was outstanding. I was travelling with a disabled and an elderly person and they looked after us and made sure we were comfortable at all times. "All perfect except the low temepraturas"
The whole trip has been very good except for low temperatures at night. We reserve a seat (the cheapest), but at night it was so cold We could hardly sleep. The ship was in perfect condition. Satisfied! Online booking with Direct Ferries was easy and efficient. Left and arrived on time. Proper comfort on a well maintained boat and in good condition. NB: You have to go to the counter of the company just before the start to show their reservation and get tickets passage present at the entrance to the boat. "Ferry Acciona from Valencia to Palma"
For a long journey like this one (specially if travelling during the night), I highly recommend booking a cabin if you can afford it. I booked only 2 days before the departure so I had to go for the reserved Seat but it’s hard to sleep on it during the night, almost impossible I would say! It was so cold during the crossing as well, which made it even more difficult to sleep well. I found the service, efficiency, cleanliness and all around professionalism to be of the highest level. It made my trip a pleasure rather than being an ordeal. Thanks. "Ship well - border into Morocco crap "
For those who just want to go to Melilla - "good". But the ship to Malaga is even better. However, those who wish to enter Marocco, should directly take the ferry to Nador, because crossing the border has gotten worse than it has been a few years ago.